Excellent Arocs looks great in Cadzow colours. Trailer is very detailed underneath. High detail on the gooseneck. Tiny graphics on the deck edges and wheel sets. Loaded with a fermentation tank. The Nooteboom Multi-PX semi low loader has a high payload with up to 14 tonnes per axle depending on the tyres used. The full programme has variety in the number of axle lines and load floors. 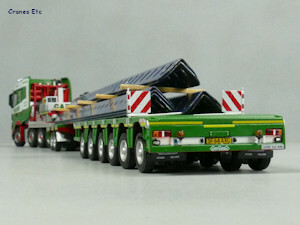 This model has a Mercedes-Benz Arocs BigSpace 8x4 tractor and Nooteboom MCO-PX 2+6 axle trailer. 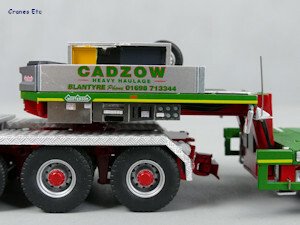 It is in the colours of Cadzow, the Scottish heavy haulage company. 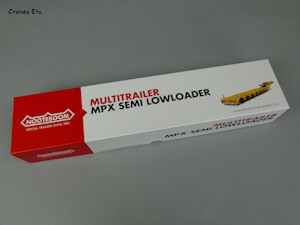 The model comes in a robust high quality outer shipping carton. 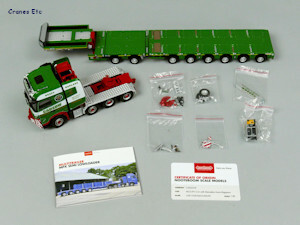 The model box is also high quality, with Nooteboom branding. The model is held within black foam which is fairly hard and is also a tight fit so care is needed getting the model out so that vulnerable parts are not damaged. There were no missing parts on the review model. One graphic on the Arocs was slightly imperfect. There is a small booklet which has interesting information about the real trailer, and it also describes most of the features of the model. A plastic Nooteboom certificate is also included. 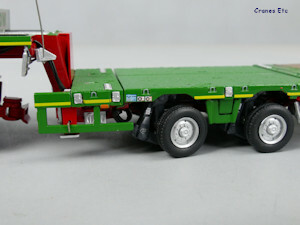 Also included is an alternative fifth wheel which will allow the Arocs to accommodate trailers with a larger king pin. There are a number of small parts to fit and some of them are very loose, so care is needed to make sure that they do not fall off and are lost. The Arocs has a detailed 8x4 chassis and the tyres are different on the steering and driven axles. 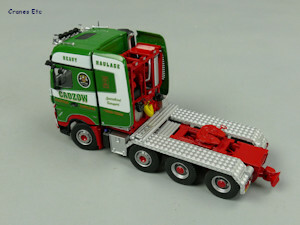 The cab detailing is excellent and the colour scheme and graphics are very attractive. Behind the cab the equipment tower is detailed and there are coiled lines. The wheel arches have very nice diamond plate texture. 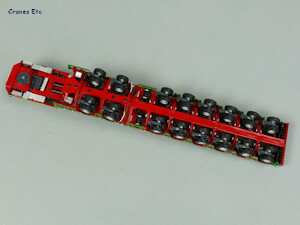 The Multi-PX has six axle lines and is heavy model. The detailing underneath is very good with plenty of hoses and tanks. The wheel assemblies are metal with tiny graphics applied, and the wheels and tyres are very good. Soft rubber hoses are provided for connection to an adjacent component. The top surface has an excellent finish with the anti-slip properties reproduced, and there are highlighted bolt positions and inlaid replica timber pieces all producing a very realistic appearance. The edges have a reflective yellow stripe and there tiny graphics and highlighted tie-down loops. At the rear the beacon lights and graphics give a realistic look. 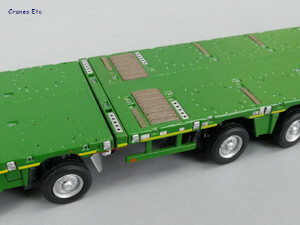 Marker boards for the rear of the trailer are mentioned in the manual and are a loose fit. The model also included marker boards for the gooseneck but there is no obvious fitting location. The two line Multi-Dolly is of the same high standard. 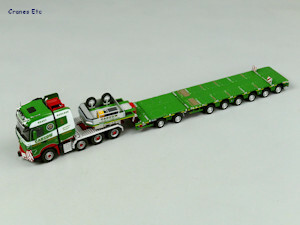 The gooseneck is very detailed and that includes the underside which has hoses and a detailed king pin turntable. The control console on the side is very finely detailed and the anti slip surface is convincing. Additional details include two spare wheel holders and a plastic generator. The Arocs steering movement has a limited range. 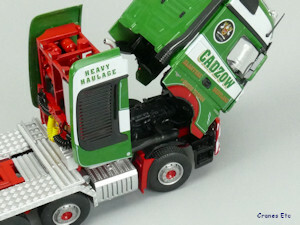 The cab tilts and it can maintain a tilted pose. The gooseneck has an adjustable angle with the rams controlling it being stiff. It has support legs which can be pinned in the up or down positions, although care is required as the pins are tiny and can drop out if the model is tilted. The Multi-PX module has independent suspension on each wheel set and there is proportional steering. The steering range is good with the last axle fouling on the rigid plastic mud flaps at the extreme range of movement. It has an extendible beam which is smooth in operation. 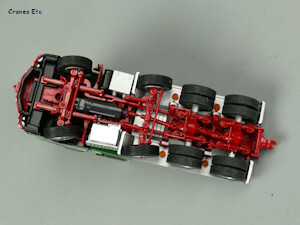 The Multi-Dolly also has suspension on each wheel set and the steering is parallel with a very good range of movement. 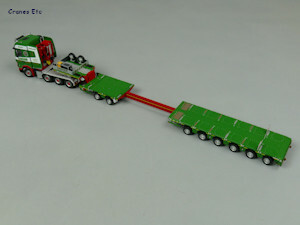 A variety of trailer configurations are possible either with or without the Multi Dolly, or with the beam extended or not. 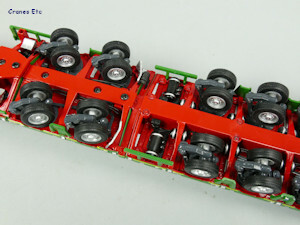 On the review model the trailer was assembled out of the box but it also had the connecting hoses joining the two-axle dolly glued meaning they would have to be cut to disconnect the dolly. This is a high quality model with a high metal content with plastic used appropriately. The paint finish is excellent, and the graphics are sharp. The price is reasonable value. 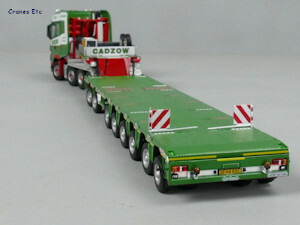 IMC Models has produced a highly detailed heavy haulage model which looks great in Cadzow colours. 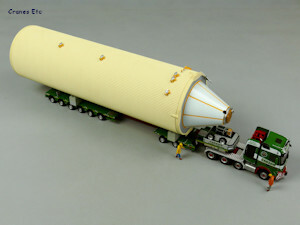 The model was released in March 2018. Booklet, card and many parts. Very good detail behind the cab.